Team Puzzle Quest - Andrew Cuneo - D3 Go! 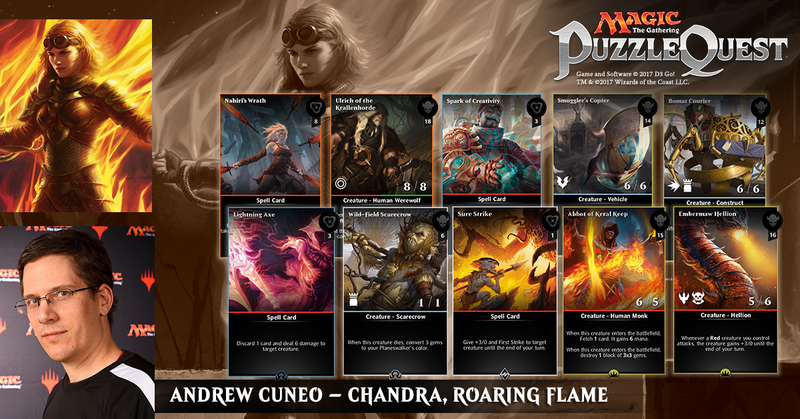 Today we introduce Team Puzzle Quest member Andrew Cuneo. These members are sponsored Magic: The Gathering – Puzzle Quest players at Pro Tour events in 2017. Please follow them on Twitter and watch them compete at events via Twitch. Top Pro Tour Results: Andrew’s best finish on the Pro Tour came in 2000 when he made the finals of Pro Tour New York. Andrew was also 1st at Grand Prix Mexico City 2017 and 2nd at Grand Prix Houston 2016. Your Go-To Magic: Puzzle Quest Deck for this Planeswalker: Spark of Creativity, Lightning Axe, Bomat Courier, Nahiri’s Wrath, Sure Strike, Embermaw Hellion, Ulrich of the Krallehorde, Abbot of Keral Keep, Smuggler’s Copter, and Wild-Field Scarecrow. I like the cheap red creature kill cards. I’m also a big fan of the huge explosions you get from Chandra’s ultimate and Abbot of Keral Keep. Blowing up the board gives you more chances to get 5 of a kind matches and power out more big spells.